How to turn website visitors into leads! Getting visitors to your website isn’t difficult, getting them to inquire is another issue. Too many companies struggle with how to turn website traffic into inquiries and then leads. 3,000 visitors a month and three leads won’t get it, but few marketing managers know how to solve the problem. 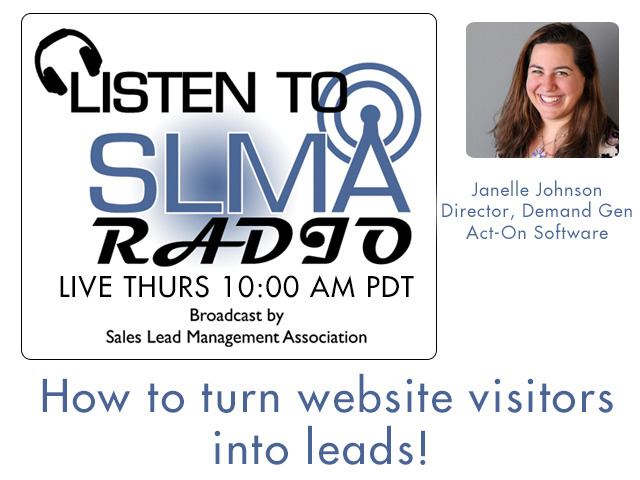 In this program, host Jim Obermayer interviews Janelle Johnson, Director of Demand Gen at ACT-On Software as she outlines how to turn visitors into leads. Janelle Johnson, Director, Demand Gen at Act-On Software. Founded in 2008, Act-On is headquartered in Beaverton, Oregon, with offices in Roseville and San Mateo, California; Scottsdale, Arizona; London, United Kingdom; and Bangalore, India. It is backed by venture capital firms Norwest Venture Partners, Trinity Ventures, U.S. Venture Partners and Voyager Capital. In addition, the company has received an investment from Stanford University. Act-On Software is the world's fastest growing marketing automation company; its cloud-based marketing automation platform is the foundation of successful marketing campaigns everywhere – from small, simple and direct, to complex globally implemented programs. It’s technology features an Instant-On™ database for accelerated campaign implementation; an easy, highly intuitive user interface; and a comprehensive, feature-rich solution set. This includes a best-in-class email engine with one-click integration to leading web conferencing and CRM solutions; tools for website visitor tracking, lead scoring, lead nurturing and social media prospecting; design tools for web forms, landing pages and emails; and more. Contrary to general industry practices, all contracts regardless of size are month-to-month, with prices starting at $500. Act-On is a sponsor of the Sales Lead Management Association.